Born November 23, 1922 in Hepburnia, she was the daughter of John and Sarah (Hollingsworth) Pontefract. As well as being a homemaker, Mrs. Wood had worked at the following business’: Ritz Grill, Airplane/Marine, Parachute Factory and the A&P Grocery Store in Indiana. She was a member of the former Grampian Church of God where she had been a member of the Missionary Society, the Penn Grange #534 and was a quilter. On April 21, 1946 in Grampian, she wed Edward Clark Wood who preceded her in death on October 12, 2006. She was also preceded in death by her parents, and the following siblings: Clyde Pontefract, James Pontefract, Pearl Guiher, Norman Guiher, Harry Guiher, Luther Guiher, Preston Guiher, Velma Guiher and Edith Guiher Gearhart and son-in-law John Hamm. She was the last member of her generation. Surviving are two children: Richard Lee Wood and wife Mona Jean and Marilyn Hamm both of Grampian; four grandchildren Richard T. Wood and wife Erin, Stacy L. Laird and significant other Ron Guelich, Steven E. Wood and wife Shelly and Shannon L. Bratton and significant other Alex Rowles; and five great grandchildren Haley, Ty, Zane, Elise and Garrett. Also surviving is a brother-in-law Gordon Wood of Curwensville and sister-in-law Elva Hackle of Ohio, as well as numerous nieces and nephews. 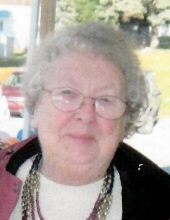 Funeral Services for Mrs. Wood will be held at the Chester C. Chidboy Funeral Home, Inc. of Curwensville on Monday April 8, 2019 at 11:00 AM, with Pastor Gust Maderia officiating. Interment will be in the Friends Cemetery in Grampian. Friends and family will be received at the funeral home on Sunday April 7, 2019 from 4:00 to 7:00 PM and again on Monday from 10:00 AM until time of services at 11:00 AM. The family suggests contributions be made to the Curwensville Public Library 601 Beech Street Curwensville, PA 16833. To plant a tree in memory of Rosella "Poad" Wood, please visit our Tribute Store. "Email Address" would like to share the life celebration of Rosella "Poad" Wood. Click on the "link" to go to share a favorite memory or leave a condolence message for the family.